Nusa Lembongan is one of three small offshore islands and a part of Bali which make up a sub-regency of Klungkung, the others being: Nusa Penida and Nusa Ceningan. Nusa Lembongan is the only one of the three islands within the sub-regency to have any tourist infrastructure and is a popular side destination for visitors to Bali. Nusa Lembongan is approximately 8 square kilometres in size with a permanent population estimated at 5,000. Twelve kilometres of the Badung Strait separates Nusa Lembongan from Bali Island. The island is surrounded by coral reefs with white sand beaches and low limestone cliffs. Nusa Lembongan is separated from Nusa Cenignan by a shallow estuarine channel which is difficult to navigate at low tide. There is a suspension bridge linking Nusa Lembongan and Nusa Ceningan and this takes foot and motorbike traffic only. There are no permanent waterways on Nusa Lembongan. 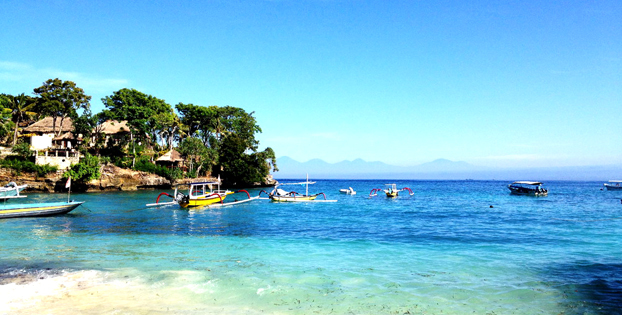 Nusa lembongan can be reached by speed boat, fast boat and local boat. Nusa lembongan located about 15 Km from Sanur and we need around 30 minutes by speed boat or fast boat to go there. Today some fast boat such as; Scoot Cruise, Ocean Star Express, Bali Brio Cruise, CB Fast Cruise and Rocky fast cruise offer daily transfer from Sanur to Nusa Lembongan. Many hotels operated in Nusa Lembongan, you can find from the cheapest hotel till most expensive one. We can find many attractive activities on Nusa Lembongan such as ; Diving, Snorkeling, Swimming, Sunbathing, relaxing, Touring and much more.